In 1848, when a torrent of freedom movements swept Europe, the German salesman Friedrich Conrad Röntgen settled in Apeldoorn. In exactly the same year another Röntgen tried his luck in the opposite direction. Engelbert Röntgen left his birthplace Deventer for the conservatory in Leipzig, to continue his violin study with Ferdinand David. Both Röntgens brought forth a famous son. 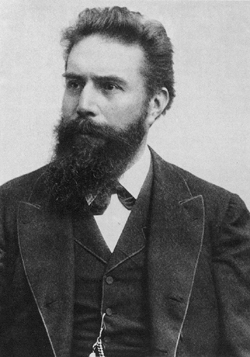 Wilhelm Conrad Röntgen, son of the salesman from Apeldoorn, discovered the rays which would later carry his name. Engelbert’s first child was Julius Röntgen. Wilhelm Conrad and Julius were contemporaries and distant relations: the grandfather of the physicist and the great grandfather of the composer were brothers. It is certain that they knew each other, though unfortunately there is no concrete information about this. It is a fact that Julius was hounded during his lifetime by the worldwide fame of his distant great uncle. Once, having arrived for his annual sojourn at Fuglsang in Denmark, a Danish newspaper reported: ‘Yesterday professor Röntgen arrived, though not the famous one.’ And when taking a boat trip down the Rhine the rumour spread that the famous discoverer of the X-rays was aboard, resulting in an entire brass band and an extra railway carriage awaiting him. Julius would also often refer to himself as ‘not the famous one’.